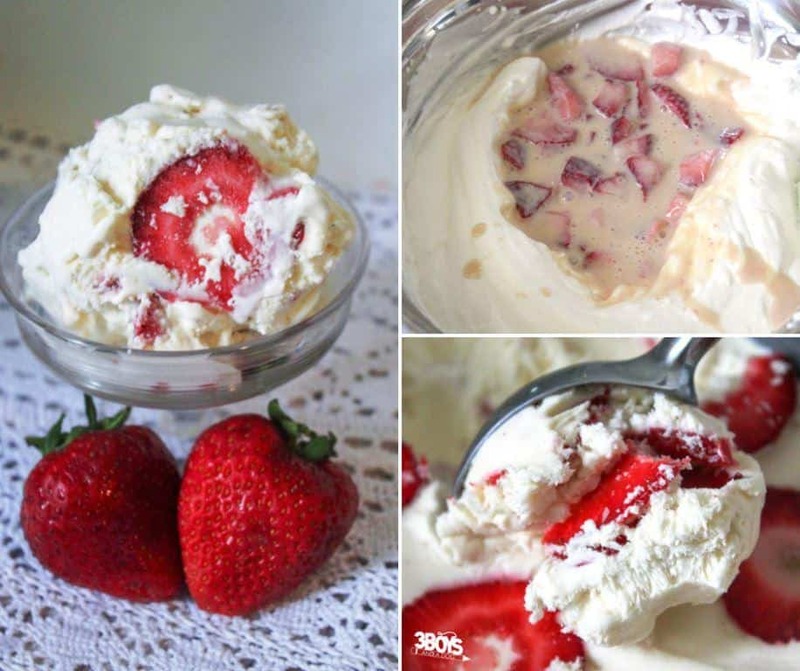 You don’t have to churn for hours to get this Strawberry Homemade Ice Cream! 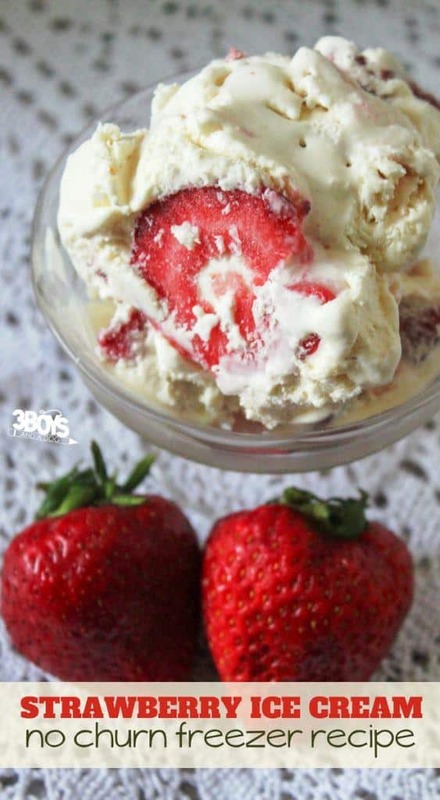 This freezer-made, no churn Strawberry Homemade Ice Cream recipe is everything! It reminds me of summer time with sticky ice cream running down my chin. The bits of strawberries make this delicious treat so very decadent! 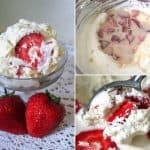 Reminder, not all ingredients in the Strawberry Homemade Ice Cream Recipe are linked above, just the ones that may be a bit difficult to find or that you might be unsure of what to look for. When making Strawberry Homemade Ice Cream at home, you really need to have the following Amazon affiliate tools on hand. 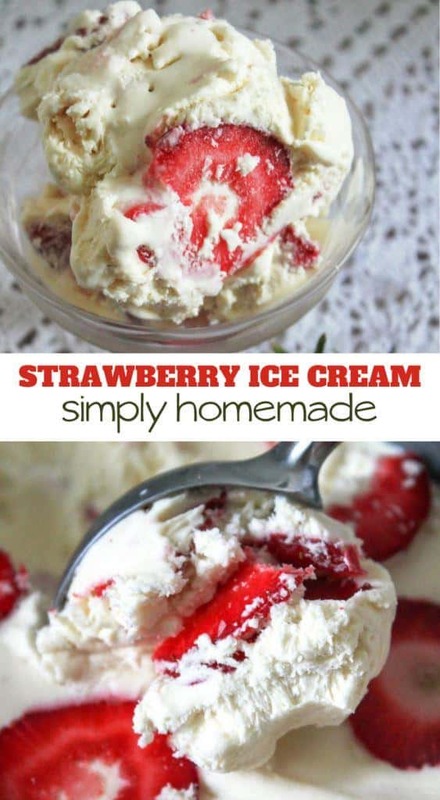 You don't have to churn for hours to get this Strawberry Homemade Ice Cream! This freezer-made, no churn recipe is everything! In a bowl, whip the heavy whipping cream until soft peaks form. Wash and slice the strawberries into bite size pieces. In a second bowl, combine the evaporated milk and strawberries. Add the strawberry extract to the evaporated milk combination. Stir until incorporated. Fold the strawberry mixture into the whipping cream. Pour into a metal loaf pan. Sprinkle a layer of strawberry pieces on top. Cover and freeze for at least 6 hours. I usually freeze mine overnight. This is a soft serve ice cream that is super creamy with chunks of strawberry. If you want a traditional pink strawberry ice cream feel free to add a few drops of red food coloring. Looks absolutely divine! Thanks for sharing the recipe with SYC. 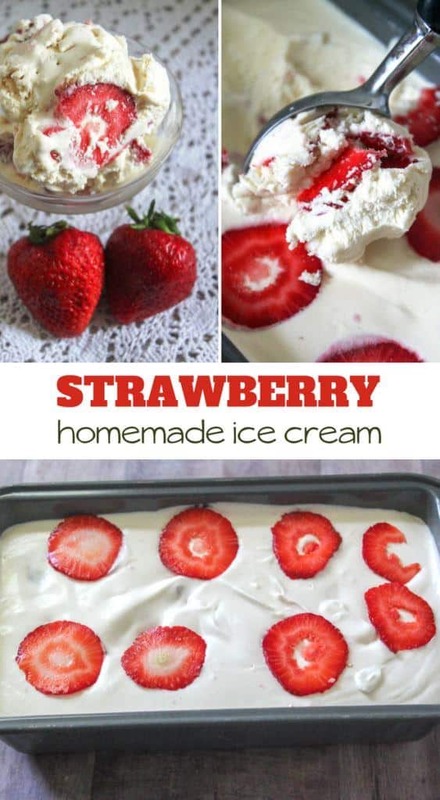 We love homemade ice cream and this looks like a great recipe! Thanks so much for sharing with us at Full Plate Thursday, we sure enjoyed your post! This sounds so yummy!!!! I can’t wait to try it! That looks great. I like no churn recipes! Thanks for sharing at Home Sweet Home!